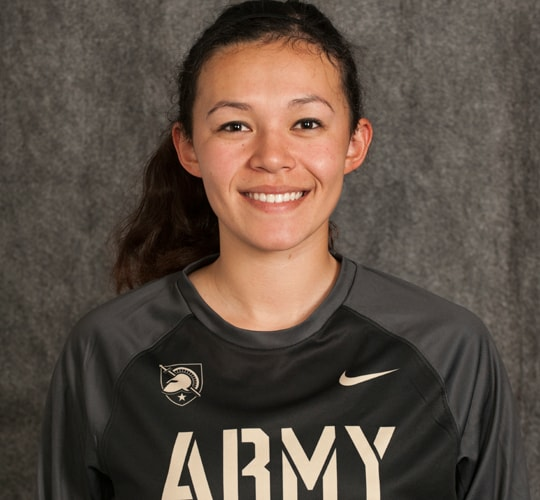 Called “the greatest basketball player to come out of a service academy since David Robinson (Waye Coffey, USA Today), her own Army coach Dave Magarity has said: “She looks like a CYO kid. It is an amazing story.” … Named Mid-Major Player of Year (espnW) in 2015-16. First active ARMY player ever to have jersey retired (No. 5; 2/24/16). Team captain final two seasons; avg’d over 22 ppg in each of final three seasons, setting new Army mark each time. Army career leader in points, scoring avg., FGs and FTs made, 3PFGM, and FT%. Three-time Patriot League POY (2013, ’14, ’16); four-time All-Conf. First Team; two-time Conf. Trnmnt. MVP; member of Patriot League 25th Anniv. Team (2015). 2015-16: All-America Hon. Mention (AP). Led Army in scoring. Tallied 21 in Patriot League title game win; had 10 points and eight boards in the NCAA Tournament vs. Syracuse. 2014-15: All-America Hon. Mention (WBCA). Ranked 8th in D-I in FT%; led Patriot League in scoring and 3PFG% (.414). 2013-14: Set team single-season marks for pts, scoring avg, FT% FTs and 3s made. Had Patriot League-record 49 pts vs Holy Cross (2/12) that included NCAA single-game marks for FTs made and consecutive FTs made (26 of 26). Had 27 pts in NCAA Trnmnt game vs. No. 4-seed Maryland. 2012-13: First in Patriot League history to be voted Player and Rookie of the Year. PREP: School’s career points leader (1,863) and an all-state pick had No. 5 jersey retired. MISC: Upon leaving USMA will be commissioned as a Second Lieutenant, joining long history of military in her family. Is a certified SCUBA diver.